Startling eBook reveals centuries-old wealth-building method. If you knew about a 200+ year-old method to building sustainable wealth, safely and reliably, would you use it? Most people gamble their financial futures using typical approaches; but as the economy worsens, the danger of these strategies is becoming painfully obvious. A powerful alternative to building sustainable wealth is to tap into the financial industry that is rated to be one of the strongest of all industries. And this same financial industry provides the perfect “sleep at night” account to hold your money while it grows tax-free. Truly understand the advantages and disadvantages of whole life without the hype. Learn the whole truth about the costs and benefits of using whole life insurance cash value. Discover ways that the death benefit can be advantageous to the insured (not just the beneficiaries). Build a small business that acts big. Get a C.L.U.E. (control, liquidity, use, equity) about your money. 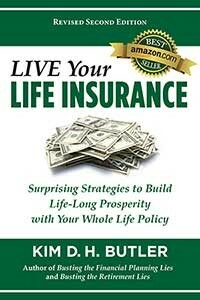 If you’re ready to tap into a resource that’s been around for over two centuries, but hidden by typical financial institutions, then you’ll love Live Your Life Insurance, the eye-opening new ebook that teaches you surprising and viable strategies for developing prosperity through your life insurance.